One of the underlying features launched originally with the Google+ project was its video conferencing platform, Hangouts. It’s been a success from the perspective of user adoption and also grabbed a partnership for Google with the NFL. Video is an extremely tough space to tackle, just ask companies like Skype, Airtime and countless others. Nailing an intimate experience that supports two or more people in a video conference is no small feat, but Google knocked it out of the park with Hangouts. Today, the team announced some new features, nothing “major,” but some really nice things that make the Hangout experience even more enjoyable and easier to use. When you’re in a Hangout, you can now display or hide a new sidebar, which shows you who’s in the room. It also sports a fit-and-finished notification system, which alerts showing in red, actions in blue and announcements in grey. Hangout apps have also been surfaced, illustrating the great work that developers have done using its API. Yesterday, I had the pleasure of speaking with Product Manager on Google+ Hangouts, Kate Cushing, about what makes Hangouts so special and how the team tackles hard problems like scaling such a service for the masses. Long story short, I injured myself yesterday, so I couldn’t visit the Googlplex to talk to Cushing. No problem. We jumped in a Google+ Hangout and chatted for a while. Her insightful knowledge of the project is extremely evident, but the nuances that I’ve surfaced in the past only became clearer as we chatted. Hangouts is where I wanted to be, it’s an exciting place to be at Google and on the net right now. Real-time communication is the next frontier. When I went away to college it was SMS and voice and for my dad it was letters and phone calls. Now it’s video chatting. I think one of the most exciting pieces around what we’re doing with Hangouts is mirroring the real-life interactions you have…but on the web. Tiny details like how we switch video when we’re talking. Switching focus is what you see on a TV show and the kind of focus when you have during a normal group conversation in real life. I can interrupt you, make a joke, fire out punchlines. The standard parts of conversations that are fun are here in Hangouts, and I can recreate the dinners that I would have with my family. It’s that real-life mirroring that makes the actual technology behind Hangouts, which is actually quite impressive, essentially disappear. To me, the best technology in the world gets out of the way and lets you do your thing. It’s one of the reasons why I really enjoy using Apple products, because even though everything is pretty, the “tech” hides itself. I honestly have to say that Google’s products are starting to show those same properties. I’ve been a digital native for as long as I can remember. My first gig was with a tech company — the same company that TechCrunch is under. I used to use AOL chatrooms, Instant Messenger, and before that, BBS. Texting, tweeting, instant messaging and video chat have always been the “same” as talking in person with someone for me, even though I’d prefer the real thing. It’s not a replacement, but it’s an enhancement when people you care about don’t live nearby. I work with a bunch of engineers in a different office and we talk about their kids and I see their Halloween photos like we’re sitting in an office. That isn’t possible without video. The same thing with my family. Last Christmas, since we’re all over the place, my grandparents couldn’t see everyone at Christmas and have never had all of their grandchildren together at once. We gave her a tablet and all of these people showed up after it dings. She got to meet her first great-grandchild over Hangouts and a tablet. The Hangout product continues to evolve under the leadership of some visionary folks at Google, but mostly thanks to the feedback from its users and “ambassadors,” which the Hangouts team works very closely with to learn about how they use the product. There are more places where Hangouts makes sense, like within education. I can totally see classrooms using the product to conduct classes or as a place where students can help one another study for a test. 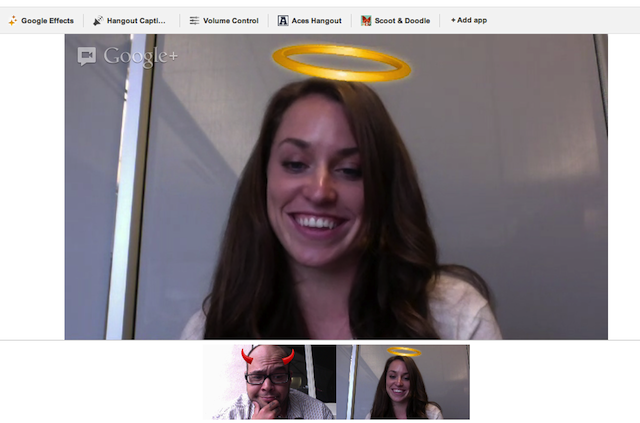 Sure, they could do this on something like Skype, but the Hangouts experience is built for a use case like this. I mean, during the NBA dunk contest, a player held a Hangout and performed dunks that were requested by the audience. That’s the next level of interactivity on multiple levels. I’d like to see television perform in this way sometime in the future. It could happen. One of the biggest challenges that we face is balancing the directed communication you want to have with people and at the same time supporting these broader conversations, along with the context and the conversation. We really care about both of those. One is innovating, and one is making it easier to let you instantly connect with someone. Figuring out how to balance the two uses of the project and deliver on both of them well. That’s kind of the challenge we face. How do you innovate and keep it simple at the same time? That’s what the team is working on. Along with that, there are things that we don’t “see,” like incremental improvements to audio and video quality, messaging on its pages and placement of buttons to keep things usable for everyone, not just tech nerds. There’s a lot going on with Hangouts, but once you start using them, you completely forget that you’re on your computer using a sophisticated technology project. It’s like you’re having dinner with your parents.